Rubik's Revenge / Master Cube / 4x4x4 Rubik's cube. This puzzle is a cube which is built from smaller cubes, 4 to an edge, i.e. a 4x4x4 cube. Each slice can rotate, which rearranges the small cubes on the surface of the puzzle. The six sides of the cube are coloured, so every corner piece shows three colours, every edge piece shows 2 colours, and every face centre only one. Unlike the normal 3x3x3 Rubik's cube, turning a face does move the face centres. The centres therefore can not be immediately used as a fixed reference point. This leaves 7!·24!·24!·36/4!6= 7,401,196,841,564,901,869,874,093,974,498,574,336,000,000,000 or 7.4·1045 positions. Denny's Puzzle Pages A very nice graphical solution, top/bottom corners and centres then edges, followed by middle edges and centres. Dennis Palaganas' page. also has a solution. Philip Marshall's page A solution that does centres, pairs up edges and then solves as for the 3x3x3 cube. Let the faces be denoted by the letters L, R, F, B, U and D (Left, Right Front, Back, Up and Down). Clockwise quarter turns of a face layer are denoted by the appropriate letter, anti-clockwise quarter turns by the letter with an apostrophe (i.e. L', R', F', B', U' or D'). Half turns are denoted by the letter followed by a 2 (i.e. L2, R2, F2, B2, U2 or D2). The above is the same notation as for the 3x3x3 cube. There is however a new type of move. The internal slices will be denoted by the lowercase letters l, r, f, b, u and d, and the type of move is shown in the same way as normal face moves. Note that these letters mean the slice only, so such a move will not disturb the corners of the cube. This is certainly not the best method, but it is how most people instinctively try to solve a cube. The reason it is not very good is that after the first layer, all further progress must disturb and restore that layer. Phase 1: Solve the top layer centres. Find a face that has as many centre pieces of the same colour as possible, and hold that on top as the U face. Turn U to place a wrong centre piece at the bl position. Find a centre piece that belongs in the U face. If it does not lie in the D face then turn u or d so that the piece is on the front face. Turn F to place the piece in the dr position and do the sequence rUr'. If it lies in the D face then turn D to place the piece in the br position and do the sequence rU2r'. Repeat the above process until all four top centre pieces are correct. Phase 2: Solve the top corners. The corners are solved before the edges because you are less likely to make a mistake in the colours of the sides that way. If you were to place the edges first and the colours of the sides were in the wrong order then the corners would not fit. The corners are solved in the same way as on the normal cube layer method. Find a corner piece in the bottom layer that belongs in the top layer. If there are none, and fewer than three corners are in place in the top layer then hold the cube so that an incorrect corner is at UFR. If the colour of the face is at the front of the piece then do R'DR otherwise do R'D'R. 1. To move FRD to URF, do FDF'. 2. To move RDF to URF, do R'D'R. 3. To move DFR to URF, do FD'F'R'D2R. By solving corner pieces which don't show the U colour on the D face first, the longer b3 case is usually avoided. Phase 3: Solve the top edges. Find an edge that belongs on the top face. Hold the cube so that its destination is at the top front. 1. To move the FDr edge to the UFr position, do FdF'. 2. To move the FDl edge to the UFr position, do BD2B' Fd2F'. 3. To move the FDl edge to the UFl position, do F'd'F. 4. To move the FDr edge to the UFl position, do B'D2B F'd2F. 1. To move the BRu edge to the UFl position, do FuF'. 2. To move the BRd edge to the UFr position, do Fd'F'. 3. To move the BRd edge to the UFl position, do F'd2F. 4. To move the BRu edge to the UFr position, do F'u2F. Phase 4: Solve the middle edges, both u and d slices. Find an edge piece in the bottom layer that belongs in one of the middle layers. If there are none, and the middle layer is not correct then choose any of the bottom edges to displace a wrong piece in a middle layer. You will have to hold the cube so that the destination of the edge is at the back left or right, depending on the sequence below, and then rotate D to bring the edge piece to the front. Do one of the following to place the edge correctly. 1. To move the FDr edge to the BRd position, do r F'R2F r' F'R2F. 2. To move the FDl edge to the BLd position, do l' FL2F' l FL2F'. 3. To move the FDl edge to the BRu position, do l' F'R2F l F'R2F. 4. To move the FDr edge to the BLu position, do r FL2F' r' FL2F'. Phase 5: Place the centres. Find any centre that belongs in the D face, and hold the cube with that piece in the R face. Turn D to bring any incorrect centre piece to the fr position. Turn R to bring the piece to be placed at the db position. Then do the sequence rd'r'Drdr'D' and turn R back to normal. Repeat this until the D face is correct. The same method can also be used to correct the other centres. To swap a piece from the F face with a piece from the R face, use the sequence rf'r'Frfr'F' which moves the Fur piece to the R face, and the Rdf piece to the F face. This is the same sequence as a in a different orientation. You may have to turn the F and R faces first to get the pieces in position for the sequence to work, and turn the faces back afterwards in the opposite order. Phase 6: Place the bottom corners. Rotate D until at least two corners are positioned correctly, ignoring their orientations. 1. To swap DLF and DFR, do R'D'R FDF' R'DR' D2. 2. To swap DLF and DRB, do R'D'R FD2F' R'DR' D.
Phase 7: Orient the bottom corners. 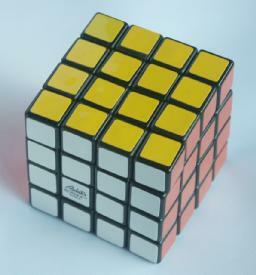 If there are four twisted corners then hold cube so that a corner which is clockwise twisted at the front left (the D colour shows on the left of that corner). If there are three twisted corners then hold cube so that the corner which is not twisted at the front left (the D colour shows on the bottom of that corner). If there are two twisted corners then hold cube so that the corner which is anti-clockwise twisted at the front left (the D colour shows on the front of that corner). Repeat a-b if necessary until the corners are solved. Phase 8: Position the bottom edges. The following list has every possible combination of three edges on three different sides, and the given sequences cycle them around. To cycle the edges in the other way, either do the inverse of the given sequence, or do it twice. If you need to cycle three edges where two of them are adjacent, then simply use one of the sequences to put the other edge correctly in place which will disturb an edge on another face. You will then have a position with three edges on different faces that can be solved by on of the sequences on the list. To make two swaps, just cycle any three of them, and you will be left with only three pieces that again need to be cycled. You may find that you end up with two edges that need to be swapped. The reason that this is possible on this cube is that slice moves perform an odd permutation on the edges. By doing a single slice move, correcting the moved centres and cycling three of the edges back, a single edge swap has occurred. Face moves are even permutations on edges, so it is not possible to perform a single edge swap with only face moves. Solution 2: Corners first method. It is also possible to do a corners first method, i.e. corners, edges and finally centres. One advantage of this is that you will not hit the parity problem, see 8b above, where two edges need to be swapped. It was solved above by doing a slice move, cycling three of its edges, and solving the centres again. By doing the centres last this is not a big problem. Phase 1: Solve the corners. Use any method you like. Use part of solution 1, or use the method for the mini cube. Afterwards the top and bottom centres should match their corners, but the centres in the middle layer need not match. Phase 2: Solve the edges in the U/D layers. Find the edge piece that belongs at UFl or UFr. If it does not lie in the middle layer then rotate the whole cube around the U/D axis to bring it to the front face and do FuF', or Fd'F' in the second case. 2. To move BRd to UFr, do Fd'F'. 3. To move BRu to UFr, do F'u2F. 4. To move BRd to UFl, do F'd2F. Find the edge piece that belongs at DFl or DFr. If it does not lie in the middle layer then rotate the whole cube around the U/D axis to bring it to the front face and do Fu2F', or Fd2F' in the second case. Phase 3: Solve the middle layer edges. In some ways this phase is similar to solving the corners of the Domino, except that an even number of turns of the sides are needed because the U/D layers must be conserved. Hold the cube so that the F and B faces need to be solved. They will only contain F and B centres. If the faces each only have one piece wrong, then turn F so that the two wrong pieces are not in the same u/d layer but are in the same l/r layer. If the faces each have three pieces wrong, then turn F so that the two correct pieces are not in the same u/d layer but are in the same l/r layer. If the faces each have two pieces wrong, and they are not adjacent in either face, then turn F so that the wrong pieces lie in the same slices as those of the B face. There is one more type of algorithm for this cube and larger cubes. This involves putting the centres correct, pairing up edge pieces, and then solving it as if it were a normal 3x3x3 Rubik's cube. It is relatively simple, as only a few new sequences are needed. To do this phase, you must know where the colours of the cube are supposed to be. If at any point you are unsure, look at the corner pieces to find out. If it does not lie in the D face then turn u and d together so that the piece is on the front face. Turn F to place the piece in the dr position and do the sequence rUr'. If it lies in the D face then turn D to place the piece in the br position and do the sequence r2Ur2. Repeat a-c until all four top centre pieces are correct. Rotate the cube to place an unsolved face at u and do a-d again. Repeat until all the centres are solved. Phase 2: Pair up the edges. Find any pair of edge pieces that have the same colours, but are not yet adjacent. Use any face moves (no slice moves) to place one at FDr and the other at FUl. Find the piece with colours matching FUr, and place it at FRd again using only face moves. If this is not possible, then put any unmatched piece there. If there are no unmatched pieces, it means that you have to swap FUr and FDr but not move anything else. The sequence U2rU2rU2rU2rU2rU2 will rearrange the edges so that you now have exactly three unmatched pairs again. Repeat a-c until all pairs have been matched. Solve the cube as far as possible using any method for the 3x3x3 cube. 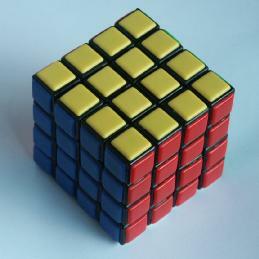 There are two situations that can occur that are not possible on the normal Rubik's cube, viz. a flipped 'edge', or two swapped 'edges'. If you end up with two swapped corners because your method solves the corners last, then do a sequence that swaps two 'edges' and two corners, for example B2U'B'UB'R2FD'F'R2 which swaps DRB-DBL, and the DB-DL 'edges'. 1. To swap DFr-DFl, do r2R2B2L' D2l'D2 rD2r'D2 F2r'F2 l LB2R2r2. 2a. To swap DFr-DBl, DFl-DBr, do d2 r2 D2d2 r2 D2 r2. 2b. To swap DFr-DBr, DFl-DBl, do B2r2 F'DR'FD' r2l2 DF'RD'F l2 B2. 3. To swap DFr-DRf, DFl-DRb, do R'Br2 F'DR'FD' r2l2 DF'RD'F l2 B'R. Note that the last two sequences are based on a double edge flip of the normal Rubik's cube, as on the revenge these perform the required two swaps without disturbing centres. These patterns were found by Rainer aus dem Spring and posted to the cube lovers mailing list.